India Camcorder market shipments volume reached 26,348 units in CY Q4 2013, an increase of 62% over the 16,391 units of previous quarter. SONY emerged as the new market leader followed by PANASONIC and JVC. India Camcorder market shipments volume reached 26,348 units in CY Q4 2013, an increase of 62% over the 16,391 units of previous quarter. SONY emerged as the new market leader followed by PANASONIC and JVC. Out of the total units shipped, Personal Camcorders captured 52% of the total market share. 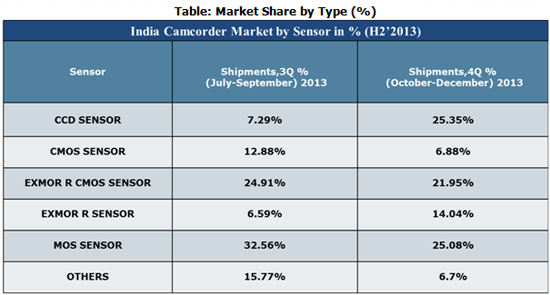 CCD and MOS sensor equipped Camcorders captured around 50% of the total market share. More than 74% of Camcorders have Screen Size of 2.7 Inch. Out of total Camcorders shipped, 96% are enabled with HDMI (High-Definition Multimedia Interface) port. The India Camcorder market witnessed a substantial increase in demand for HD (High-Definition) enabled recording devices. The Indian consumers are not merely satisfied with the SD (Standard-Definition) enabled video recording but they are also looking for camcorders with more advanced features. This trend is also observed during CY Q4 2013, where camcorders having HD resolution of 1920x1080 captured 67% of the total market share. The Indian Camcorder market has faced stringent competition from Digital Cameras and High-end mobile phones and as a result the Camcorder’s witnessed slow growth over the past few quarters. However, the Camcorder’s registered positive growth as a result of price reduction during CY Q4 2013.